Microsoft Dynamics NAV offers a service dispatch board to help users allocate the appropriate service resources to service orders and service order lines. However, other than the word "board" let's you assume, this dispatch lacks any kind of visualization capability. Learn how you can enhance the standard Dynamics NAV service management functionality by both a visualization of a service plan for all staff members and a view of orders that are not yet allocated. Ideally such a visualization is interactive and allows the dispatcher to build the service plan via drag & drop, thus achieving optimum staff utilization and ensuring the execution of service orders in time. Such a visualiziation is achieved by the Visual Service Scheduler add-in which comes with two views for allocating service orders. Learn in this blog post how these two views support the dispatcher's scheduling needs ranging from meeting service level agreements (SLAs) and achieving an optimal utilization of service staff. The typcial service scheduling workflow in Microsoft Dynamics NAV is a two step approach, whereas both steps can happen simultaneously or one after ther other. A sales and/ or service contact person creates a service order including some basic information such as customer name, service item(s) and associated SLA (response date). The dispatcher then is to assign these service orders to service technicians and to plan for the time that working on these service items should take. Which are the service orders that are not yet allocated to a service technician? How urgent are they and are there any SLAs with the customer in terms of response time? 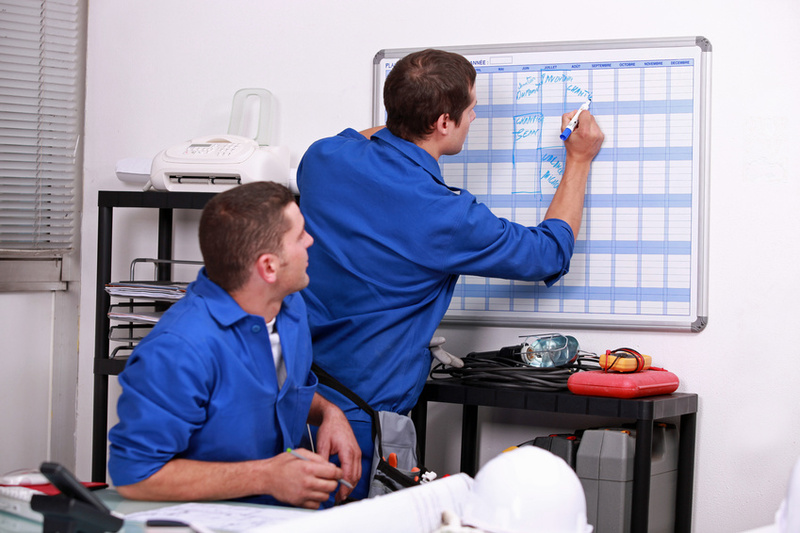 What are the schedules of the service technicians? When are they “booked” to be at a customer? Who of them is available to take an urgent task? How will their schedule change if tasks are moved? The „Two Gantt Chart“ view focuses on scheduling the service orders by their due date, which is called response date in Microsoft Dynamics NAV. Two Gantt charts are arranged one below the other, the upper one showing the service employees and their already allocated orders while the lower Gantt chart visualizes the unfilled orders by means of round symbols, the symbol being placed at the order’s due date. The upper Gantt chart serves for checking which employee has free capacities to take on the service order so that the SLA can be met. The dispatcher then vertically drags the service order to the selected staff member. This then automatically creates a service order allocation, of which the dispatcher can change the duration with simple mouse controls. The "Tree & Gantt chart" view is a combination of a Gantt chart, a capacity load chart and a tree chart. In this view the dispatcher can fully concentrate on the optimum utilization of employees. 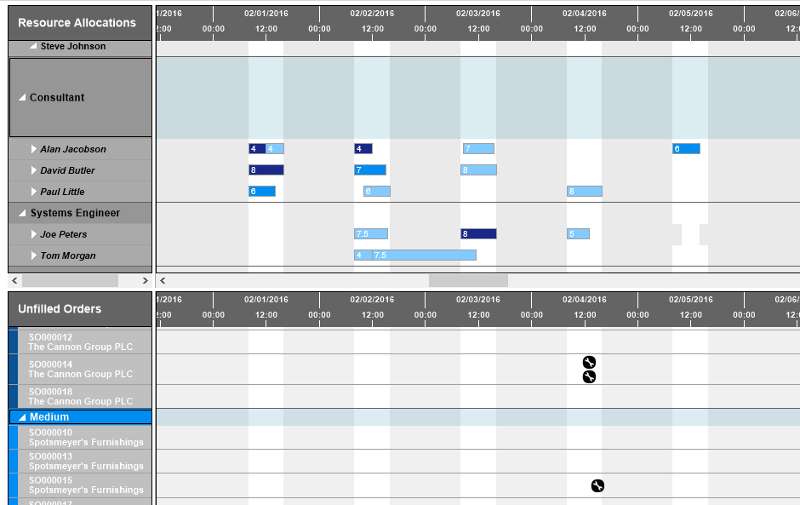 The capacity view below the Gantt chart illustrating the employee’s utilization supports him in doing so. 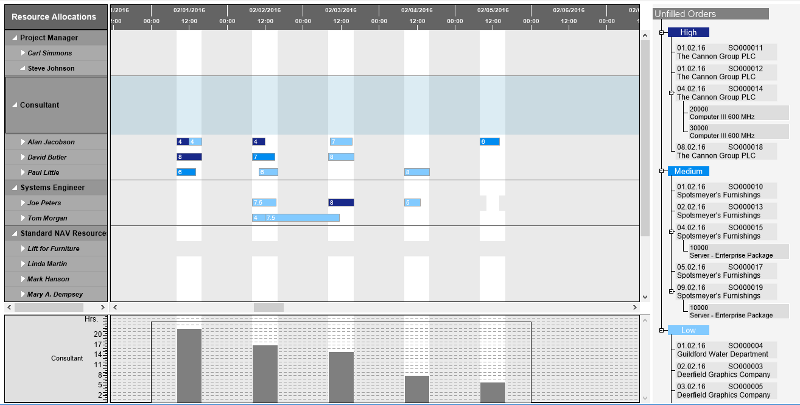 A tree chart arranged right next to the Gantt and capacity chart shows the unfilled orders in a hierarchical arrangement, classified by their importance level. This view also allows for a very simple allocation of service orders: By mouse, the dispatcher drags an order from the tree to the Gantt chart to the chosen staff member at a desired date. If the degree of utzilization in the capacity chart turns red, the dispatcher either has to allocate the order to another employee or to change the processing deadline by simply shifting the bar horizontally or vertically. Especially where medium-term service scheduling is concerned, the first step will not necessarily be allocating service orders to a certain employee but scheduling them on group level first. 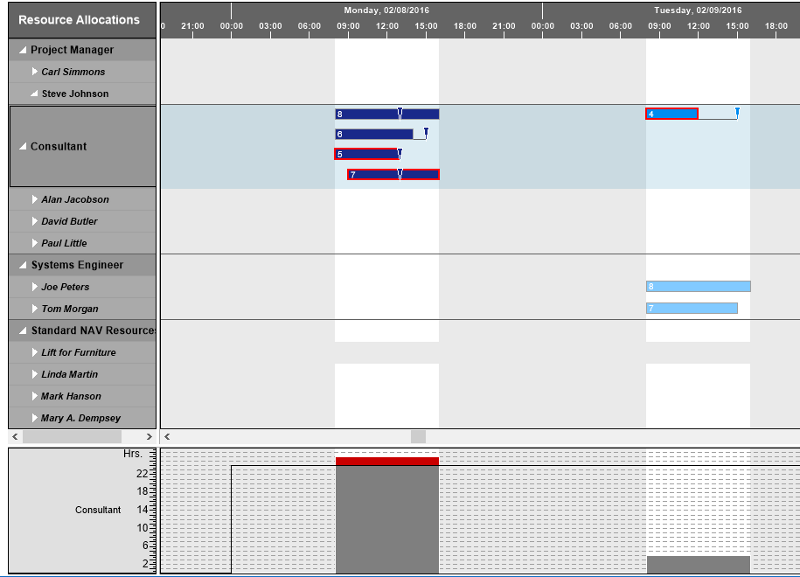 To show the capacity of a group, the Visual Service Scheduler (VSS) sums up the daily working hours of the groups’ employees. The chart visualizes the maximum capacity and the capacity of the group’s employees having already been scheduled. As soon as the order volume exceeds the group’s capacity, this period will be indicated in the capacity chart by turning red. So when dragging an unfilled order to a group, the dispatcher immediately recognizes whether a new order would lead to the group’s overload or whether scheduling will be possible. Like what you just read? Well, seeing is believing! Watch this introduction video and see how the Gantt add-in considerably simplifies the dispatchers’ service order management and will lead to an improvement of customer service. Want to learn more about Dynamics NAV visual scheduling? Then read our blog post Why do Dynamics NAV users need visual scheduling?